One of the best things you can do to stay motivated to keep plugging along on your book is to have a space where the inspiration and creativity flows freely. Setting up a home office or workstation can be a tricky endeavor, though, because you want to ensure that it feels inviting, and like a place you want to spend your time, while still being free of the distractions that can pull you away from your work. So with this in mind, consider these tips to make your writing space as conducive and inspired as possible. With just a few small changes, any home office, desk, or small corner of the home can be transformed into an ideal spot to write. You want your workspace to be designated for writing alone, and far from any other noise, electronics, or other disturbances that can throw you off track. So find a cozy nook or corner far from hubs of activity, or designate a small room in the house just as a home office – and no other purpose. A touch of nature can do wonders for sparking creativity for artists of all mediums – including and especially writers! Keep a favorite plant or a bouquet of flowers clearly visible on your desk for a small burst of green that can spark inspiration. Lighting can have a huge role on your productivity and mood, and a well-lighted space will boost your energy levels and make you more focused on the work at hand. 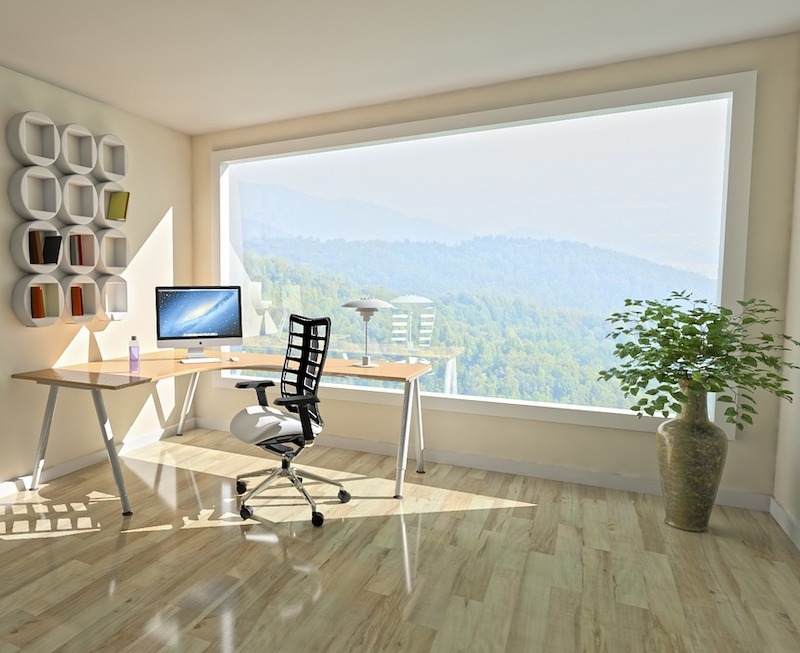 Natural light is best, so choose a sunny spot in the home to work, and open up the blinds. If it’s impossible to achieve ample natural lighting, (or if you work in the evenings), then try using LED lighting which most closely resembles natural sunlight. Just as a busy mind can veer your thoughts in a million different directions, a busy room can cause ample distractions as well. So keep your workspace as organized as possible, and remove anything that can lead your thoughts elsewhere – like electronics, excess papers and books, and all those other little items that tend to pile up on your desk over time. Do you have a picture, photo, or décor item in your home that you love to look at? Perhaps you find it moving, or it evokes a happy or thoughtful mindset, or maybe it’s just a piece that inherently gives you joy. If you do, then move it to your workspace! Having artworks, décor items, and other little touches that you love will make your workspace inviting, and may even ignite the artistic parts of your brain to help you write freely, and write well. Writing should be an activity you enjoy, and by creating a space designated solely for your work, you can make sure writing is as pleasurable as possible. So keep your office or workstation quiet, keep it clean, and keep it inviting, and you’ll see how a great writing space can lead to great writing in no time at all! Want even more tips for finishing that book inside your mind and sharing your story? See what my three day event, the Book Bound Workshop, coming up in June, can offer! Join the event in Dallas, TX and learn more about writing and becoming a published author, and even make a network of authors like you! In the meantime, see some recent helpful blog posts for lots of writing tips to get your story out of your head and on to paper! An inspired workspace leads to inspired writing! Read on to uncover how you can make your office or workstation as productive and inviting as possible. Is Your Office Clean or Dirty? 8 Places to Tackle Clutter and Regain Space in Your Life!